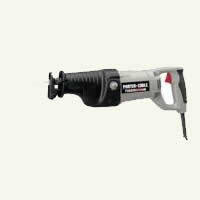 Having the proper portable power tools for each job means that you will be working safer and more efficiently. Every handyman dreams of having the perfect workshop, fully equipped with the latest in power tools and although few of us can ever realize that dream, we can buy reasonable quality and have the power tools necessary to complete the projects that we start. Whether you need a power tool to complete a current project or you are buying a gift for the handyman in your life we have chosen what we feel are quality products, that will, if properly used last a lifetime. The following information is an overview of some of the many power tools that are available. By no means is it to be considered a definitive list. The pictures chosen are not meant to indicate a specific preference for a specific manufacturer. They were chosen, because they clearly identified the type of power tool. The size of the chuck - most common being 1/4", 3/8" and 1/2"
The amperage of the motor - the more amps the more torque, the higher the torque the easier it is to drill into harder materials such as concrete and plaster. Electric drills can have numerous other features; Reverse, speed adjustment, depth gauge and a keyless chuck are the three most common features. Other features include the ability to hammer during rotation. This feature is a must if drilling into concrete. 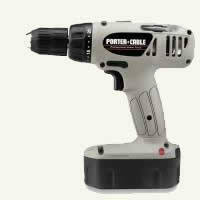 The reverse and speed adjustments allows the drill to perform the function of an electric screwdriver. A cordless drill provides all of the features of the basic electric drill without having to plug it into a power socket and hence reduces the need for extension cords. The negative is that the batteries have a limited life and must be recharged in order to perform a task, if you have a project that requires a drill throughout the day, you will need a minimum of three batteries (two continually being recharged). It should also be noted that the batteries will not last as long as the drill and will need replacement. 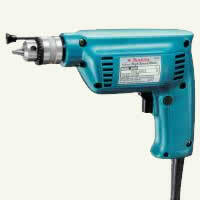 A cordless drill is available with all of the features of the basic electric drill. Diameter of the blade - most common being 7 1/4"
The amperage of the motor - the more amps the more torque, the higher the torque the easier it is to cut harder lumbers such as oak and maple and thicker boards. 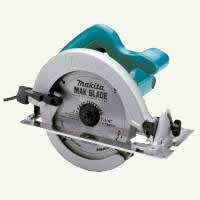 The abilities of the circular saw are really driven by the type and style of blade that is mounted on the saw. Other features can include, superior worm drive gearing and laser tracking. Also see the Guide For Selecting Circular Saw Blades. A saber (jig) saw is an excellent power tool for doing cutting small pieces of lumber such as moldings and intricate shapes such as circles and curves. A saber saw is generally sold based on the amperage of the motor. Features can include an integral light to see the area to be cut, speed control which is advantageous when cutting plastics other types of materials. The materials that a saber saw can cut are determined by the blade used, not the saw. A saber saw can also be purchased as a cordless device. A reciprocating saw is the perfect power tool for rough cutting, especially for demolition work. It is sold base on the amperage of the motor. The higher the amperage the more power that is available to cut through material. A vast assortment of blades are available for different types of materials. Reciprocating saws can even be used to prune trees and bushes. Reciprocating saws can also be purchased as cordless devices. However, it uses a high amount of battery power. If you have projects that require the use of reciprocating saw for extended periods of time a cordless unit is not recommended. An sander uses round shaped sandpaper discs, the most common are 4". 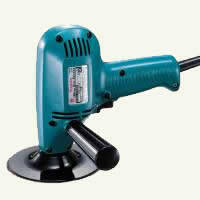 The orbital sander can also be used as a polisher. 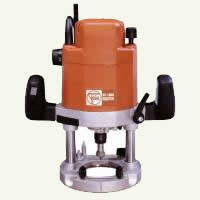 There are two versions of the orbital sander. The first is a basic unit that continuously repeats the same orbit pattern. The second tool is one that has a random orbit and does not repeat itself. The random orbital sander produces a better finish without sanding lines in the wood. Orbital sanders are sold based on the amperage of the motor. Options include secondary handles, variable speed and dust collection bags. Belt sanders are sold based on the amperage of the motor and the width and length of belt that fits the power tool. Standard sizes are 3" x 21", 3" x 24" and 4" x 24". The bigger the belt the easier it is to maintain a smooth surface when sanding. It takes some practice to use a belt sander as they are notorious for gouging lumber. This is caused by leaving the belt sander in one position and by turning it off while it is in contact with the material being sanded. Option features include dust collection bags and connections for industrial vacuums. A finishing sander is a must if your project requires fine lumber material finishing. It provides the smoothest of all the sander finishes. 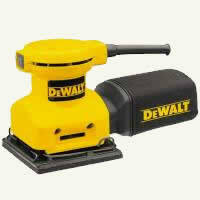 A finishing sander usually takes a 1/2 sheet of standard sandpaper. 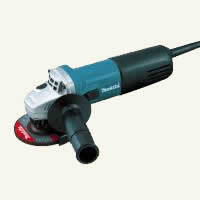 Options for a finishing sander include, dust collection, variable speed, and secondary handles. 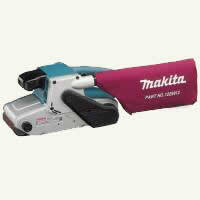 The item to look for when purchasing a finishing sander is the ease of attaching and replacing sheets of sandpaper. A palm sander performs the same function as the finishing sander. Many people believe that it is easier to use because it literally fits in the palm of your hand when in operation. A palm sander uses a 1/4 sheet of standard sandpaper. Options include dust collection and lights. 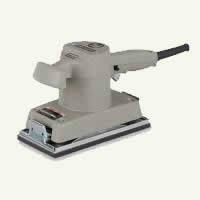 The item to look for when purchasing a palm sander is the ease of attaching and replacing sheets of sandpaper. 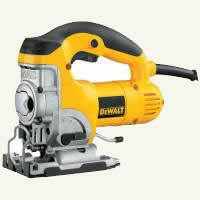 Once a tool for professionals a hand grinder can come in handy if you undertake major home renovation projects. The unit is sold based on amperage and weight. Option include secondary handles and variable speed. If you do any cabinet work than a router is a must have power tool. Although it is the router bit that determines the quality and shaping of the finished cuts, the weight, position of the handles and ease of seeing the position of the bit are all key features of any specific router. The plunging feature allows the operator to conveniently start the bit in the middle of a board. Options include lights, dust collection, quick change chucks and guides.